Talking to customers is the lifeblood of any product-first company. Failure to do so regularly causes companies to lose sight of the problem they’re trying to solve. Here at Intercom, talking to customers is a core value; every team, from product to marketing and analytics, connects with users. While Support and Sales rely on Respond, almost every other team at the company uses Engage in their everyday workflow. In August 2016, I became the Growth Product Manager for Engage. To better understand how to support the future growth of my new product, I began to explore our own automessage usage. Our customer messaging strategy started in 2015 with 15 auto messages sent on a fixed schedule; by January 2017 it had grown to 150. At the same time our headcount tripled from less than 100 to more than 300. ? It was clear that our messaging strategy needed to be updated, so we developed and enforced strict rules about who, when and why someone sends messages to customers throughout their lifecycle. Fortunately our product team had just shipped Smart Campaigns for Engage, which offered the visibility we all needed to support the next iteration of our onboarding message schedule. Relevant: When a new user signs up for Intercom, he should receive the onboarding messages that are most relevant to his subscription and product usage, so that he is likely to complete the promoted action. 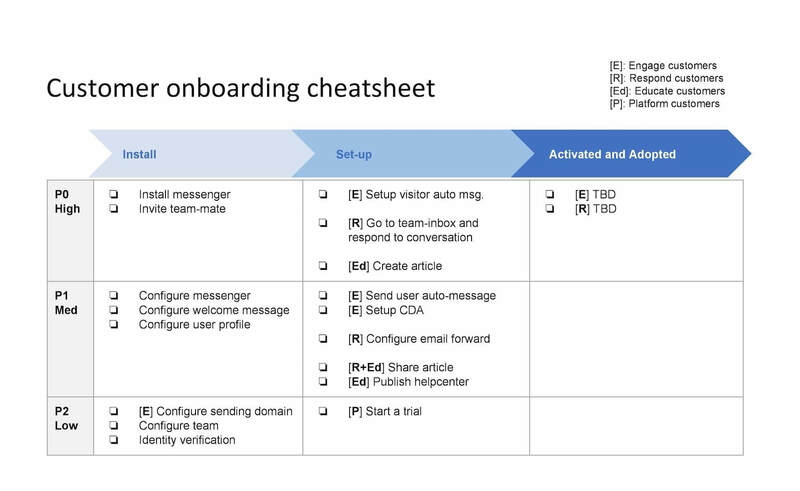 Context aware: When a user receives an onboarding message from Intercom, she should receive messages at an ideal interaction point and cadence, so that she does not consider the message “spammy” or interruptive. Measureable: When an Intercomrade wants to evaluate the success of similar types of messages, he should be able to easily benchmark and compare engagement metrics, so that he can easily identify opportunities for further inquiry and improvement. Flexible: When an Intercomrade wants to add a new message to the existing schedule, she should be able to clearly identify competing messages, so that she can correctly prioritize and rebalance the messages within the existing schedule. To measure for success we considered a number of KPIs measuring different pieces of the messaging and customer journey and that depended on the products users owned, but they all centered on improving 30-day retention, since that was the primary timeframe we would be targeting with these messages and our goal would be to improve customer success overall (rather than any one action). Each message was tied to a specific user action to ensure that the message was having the expected impact. I would love to tell you that we shipped it and it was perfect and I never had to think about our onboarding message strategy again — but anyone who’s ever built a message campaign knows that that’s not how it works. Even if you get it right the first time, your goals for messaging will evolve with your product, so having a way to painlessly revisit and revise will yield many benefits down the road. Users who get blocked aren’t going to wait on your message cadence to solve their problems. One of the most interesting insights from the process was that some problems simply cannot be mitigated effectively with proactive messaging. For basic setup, customers needed the information sooner than a message could reach them; that’s where bots like Operator are better able to assist in real-time. Inviting a teammate, for example, is often required just to get the customer’s initial setup completed; certain app-level settings had to be configured almost immediately for customers who needed them. Users who get blocked aren’t going to wait on your message cadence to solve their problems. Both before and after these changes, we saw significant improvements from this approach. We can send more messages, at more relevant moments, while maintaining the same (or better) message engagement behavior. It was also much easier to identify opportunities for improvement and experiment with different approaches. As you scale and your product matures, you will face an increasing number of potential opportunities to talk to your customers. It’s important to maintain a great customer communication experience throughout, and the best way to do so is to continuously re-evaluate your priorities and message goals. By keeping your focus on the big picture of what you’re trying to accomplish with all your messages, you can easily identify new opportunities and plan for the changes to come.